NYU has adopted the Lean LaunchPad® class as a standard entrepreneurship course across twelve different schools/colleges within the University. 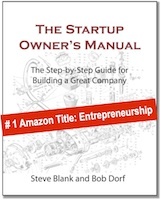 Over 1,000 students a year are learning lean startup concepts. In August 2011 I received an email from someone at NYU I never heard of. Frank Rimalovski, the Executive Director of the NYU Entrepreneurial Institute, had just read about the National Science Foundation Innovation Corps (I-Corps) in my blog, and he absolutely had to meet me. To Frank’s credit he wouldn’t take no for an answer. When I said, “I’m too busy,” Frank said he’d fly out to fit into my schedule. When I said, “I’m at my ranch on the coast,” Frank promised to drive to Santa Cruz as soon as he get off the plane. I figured any academic who was as persistent as an entrepreneur had earned my time. So we met, and I learned a lot. First, I learned that Frank was not your typical academic. He was a career VC, now at NYU and charged with building an entrepreneurial ecosystem across the university. Frank’s goal in the meeting was to figure out how to ensure that NYU would be one of the new universities selected when the National Science Foundation scaled the Innovation Corps nationally. (The Innovation Corps, or I-Corps for short, is my Stanford Lean LaunchPad class offered by the National Science Foundation to our leading scientists. The Lean LaunchPad class teaches students how to build a Lean Startup using business model design, customer development and agile engineering. Teams have to get out of the building and talk to 10-15 customers a week.) I gave Frank the same advice I offered all the other universities who asked. But the difference was that Frank took it and made it part of the NYU proposal. In 2012 NYU partnered with the City University of NY (CUNY) and Columbia University, and in early 2013 they won a grant from the National Science Foundation to build the Innovation Corps in New York City and jointly create the the NYC Regional Innovation Node (NYCRIN). As part of the National Science Foundation I-Corps program, NYU was responsible for training our country’s top scientists – and they’ve taught 170 of them so far. But what NYU did with the rest of their grant dollars was simply brilliant. Over the last two years they used part of the National Science Foundation funds to send eight NYU faculty to California attend the Lean LaunchPad Educators program. (The Educators Program is a 2½ day class that teaches faculty how to create and teach their own Lean LaunchPad class.) In exchange the faculty had to agree to teach a Lean LaunchPad class at NYU within the next year. Unbelievably, they’ve delivered – and more. 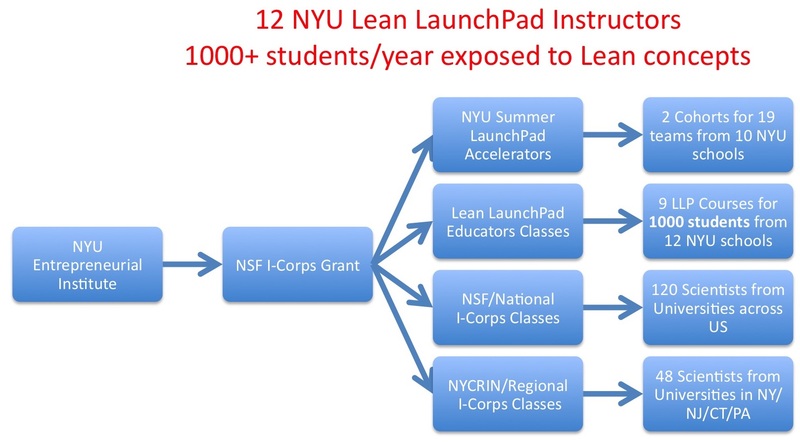 By this spring there will be 9 different Lean LaunchPad classes with 12 NYU instructors (and several more gearing up) teaching Lean at 12 of the schools/colleges within NYU. Some of these were brand new classes while others adapted existing business, design and engineering curricula to utilize the Lean approach. 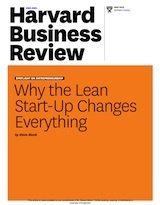 In two short years, the Lean LaunchPad has had a major impact on teaching entrepreneurship at NYU. Starting this year all 750 incoming freshman at the NYU Polytechnic School of Engineering take the required Innovation and Technology Forum class. The class has been updated to cover the key elements of the Lean Startup (customer development, customer segments & value propositions, product/market fit, and minimal viable products)! In addition, 165 students from twelve different schools/colleges within the University took the full Lean LaunchPad class this year. And in each of the past two summers 10 teams with 30 students participated in the NYU Summer Launchpad accelerator program. Frank even convinced me to come to New York and teach a five-day 10-hour-a-day Lean LaunchPad class with him and his team each August. Tlacael Esparza recently received his masters in music tech from NYU Steinhardt and is the co-founder of Sensory Percussion. “…I found the idea of doing 10-15 customer interviews a week daunting and distracting. How can I commit to “getting out of the building” when I have so much more work to do building and improving our first product? … However, going through the customer development process showed me the danger in that kind of thinking. In talking to musicians and music producers…there was a lot to be learned about how our competitors’ products are perceived and used and how Sensory Percussion would fit into the current eco-system.” Read Tlacael’s blog post about his Summer Launchpad experience here. Fang-Ke Huang is a postdoctoral fellow in NYU Langone Medical Center, applying the proteomic approach to understand the brain’s functionalities such as learning and memory. “…(The) class taught me not only the importance of customers, but also the application of the scientific method to the business model...I also learned that an entrepreneur should have a productive attitude towards setbacks. 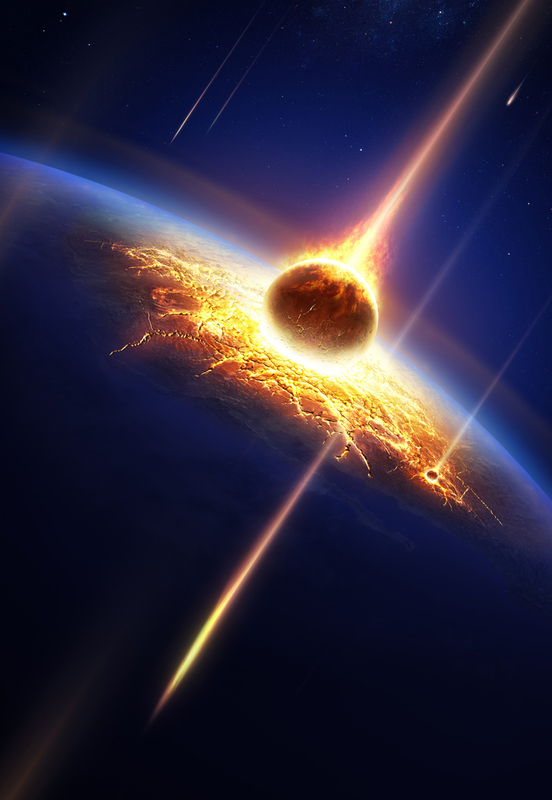 …, I started to view setbacks as a chance for feedback and as opportunities to redirect my efforts.” Fang-Ke’s blog about the class is here. 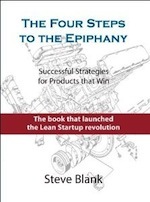 Last but not least, Frank thought that neither the Four Steps to the Epiphany nor the Startup Owners Manual had enough specific advice on Customer Development. (Ouch.) I told him that if he thought he could do better he should write his own book. So Frank did. He collaborated with Giff Constable and wrote Talking to Humans: Success Starts with Understanding Your Customers to guide aspiring entrepreneurs through the process of securing, conducting and synthesizing early customer discovery interviews. And you know what? It is a great book. I used it in the I-Corps @ NIH program, and it’s now one of my class texts. Congratulations Steve!! You are changing the entrepreneur’s world! Massive thanks!!! Steve – this is great to see. I’ve been working with a few of the universities down in the Philly area and we’ve been pushing them to include more lean and develop classes that bring students from various programs together. One of the universities I’m working with has a solid business school + a design school which could probably cultivate some amazing interactions but they are essentially walled off from each other. This needs to change. Great post as always, Steve! Please tell me your trip to Melbourne in October was to get this happening/moving along in Australia. The “Taking to Humans ….” book is a great idea, I’m off to buy it now. Thank you! I am a big admirer of your work and am a firm believer in The Lean Startup and Lean LaunchPad principles having been part of six startups. Keep working to have Lean LaunchPad as part of every college and high school in the country. As a grad of both the University of Washington and Northwestern’s Kellogg Graduate School of Management I hope that both schools will follow NYU’s lead. You are absolutely outstanding Steve, I love your work! Unfortunately I couldn’t make it seeing you in Melbourne recently, I am member of the University of Melbourne Alumni Council for Business & Economics and I’d really like to be able to roll out this I-Corp programme in Melbourne and learn what impact it’s had with NYU sometime. I too run my own company (rozibaby.com) and I’m the only entrepreneur on the Council (who are all corporate) so I’m sure this new appointment is going to be a challenge! Thank YOU, THANK YOU! Your work has transormed and redirected our start up and probably saved us hundreds of thousands of dollars!! The positive impact on students is especially beneficial, because young people get practical experience, and nevertheless helps to improve the level of entrepreneurship.